Last December, YIMBY posted the first preliminary renderings for 281 Fifth Avenue, a 52-story condominium tower that will soon begin construction on the southeast corner of 30th Street and Fifth Avenue. Permits for the project were filed early last month, and now YIMBY has obtained the first actual rendering of the glassy building, which is being designed by Rafael Viñoly. Victor Homes is developing the site after picking up the assemblage for $99 million last year, and Lend Lease is helping finance and co-develop the project, which will have a total cost of $400 million. DOB permits show the 52-story building will stand 705 feet tall, with 141 condominiums units splitting 209,087 square feet of space. Residences will average nearly 1,500 square feet apiece, and the project will also include 7,900 square feet of retail space on the first two floors. Apartments will range from two to four units per floor, besides full-floor units on the eighth, 49th, and 50th stories. Amenities (including a lounge, fitness center, library, and spa) will be located above the retail space. 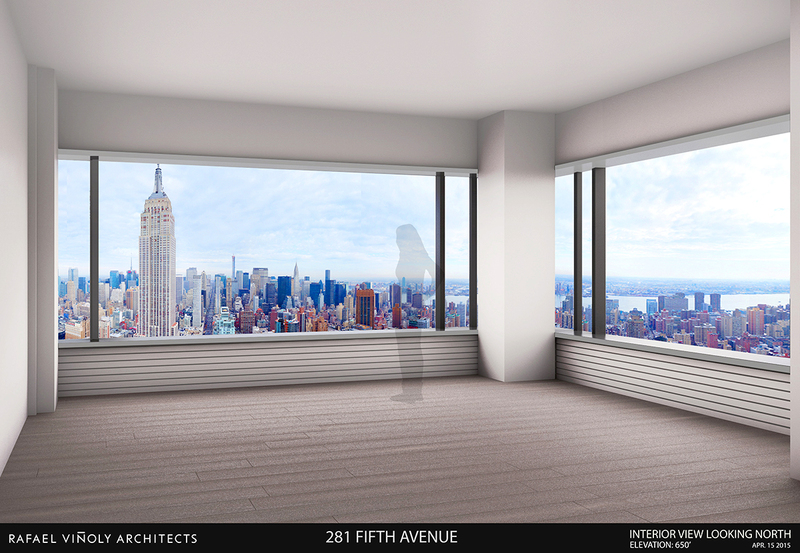 The first renderings available were massing diagrams from the project’s EB-5 materials, where two different versions were presented, and the new image matches the more streamlined version very closely. Viñoly is becoming increasingly popular in New York City for high-end residential projects, and while 432 Park Avenue is the architect’s most notable addition to the skyline, he has another major project in the works at 125 Greenwich Street. 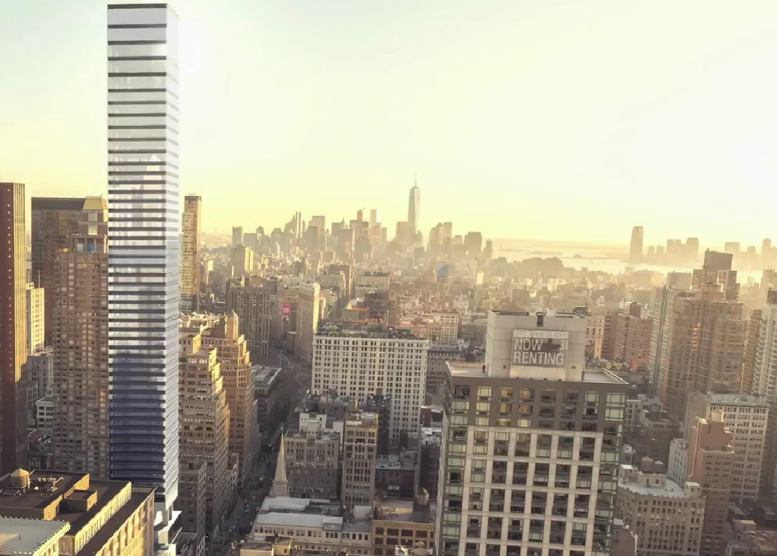 281 Fifth Avenue will more closely resemble the latter project (or at least what YIMBY has posted so far), with an all-glass facade encapsulating a simple, boxy, and slender envelope. Floor-heights increase as the building rises, adding some dynamism to the tower, which is otherwise very simple. YIMBY has also obtained an interior rendering of the project, which is not incredibly detailed, but does give an idea of standard ceiling heights and potential views. 281 Fifth Avenue sits directly across from 126 Madison Avenue (formerly 15 East 30th Street, revealed by YIMBY last week), and both buildings will exceed 700 feet in height, though 126 Madison will be slightly taller. Another condominium project is also likely in the works at 3 West 29th Street, on the other side of Fifth Avenue, where HFZ recently demolished the old Bancroft Bank Building. As for 281 Fifth Avenue, demolition of the site’s old buildings is now underway, and completion is likely by 2018. 2 Comments on "Revealed: 281 Fifth Avenue, 52-Story NoMad Condo Tower Designed by Viñoly"
The demolition at the corner of 5th and 30th for this building has only just started.